Whether you’re searching for a lost relic hidden within remnants of an ancient empire or fleeing the violence of a hungry tribe of cannibals, Pathfinder Flip-Mat: Forbidden Jungle has you covered. Each side of the Flip-Mat features the thick foliage of dense rainforests hiding savage tribes, terrible traps, and hidden riches. One side features the twisting highlands of the jungle with winding paths overlooking rushing rivers while the second uncovers a hidden enclave of jungle dwellers! Don’t waste your time sketching when you could be playing. 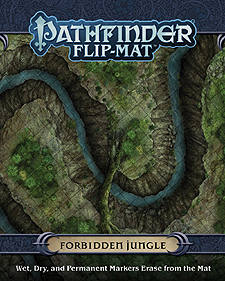 With Pathfinder Flip-Mat: Forbidden Jungle, you’ll be ready next time your players want to hack their way into danger amid uninviting lands.